Relationship astrology or “synastry” explores both the bonds that unite couples as well as the conflicts that cause strains in relationships. Sun-Moon and Venus-Mars aspects are very popular in romantic synastry readings: The former shed light on potential emotional connections and the latter are all about passion and chemistry. 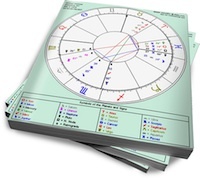 But if you want to add an extra layer of understanding to relationship analysis, you would do well to invest some time in looking at nodal connections in synastry. The nodal axis speaks of the trajectory of a soul’s growth. While the South Node represents the skills a person has mastered in the past, the North Node describes the current learning task. Some people ascribe karmic significance to the nodes and believe that one person’s planets touching the other’s nodal axis indicates a karmic link. If you subscribe to this belief, then someone’s planet touching your South Node shows a past-life connection. The planet involved reveals the nature of the past relationship: Venus conjunct the South Node points towards a past-life lover; the Moon conjunction may indicate a maternal figure; and Jupiter, a teacher or a benefactor. North Node links are also powerful. Since the North Node is the energy or the lesson that a person needs to learn, these connections are believed to be stronger compared to the South Node when it comes to predicting the longevity of relationships. The person whose planet aspects another’s North Node is like a teacher pulling them toward their future personal evolution. Bill Clinton’s Taurus Moon is conjunct Hillary’s North Node and her Descendant. Her stellium in Scorpio makes Hillary an intense woman and her Pisces Moon indicates great emotional sensitivity. For her, Bill’s emotionally steady and down-to-earth Taurus Moon is like the proverbial Rock of Gibraltar on which she can lean in times of turmoil. But more than that, this aspect of his personality is something that she needs to emulate if she is to grow as a person. North Node bonds, since they are future-oriented, are a contributing factor in relationships that endure. Significant relationships, both platonic and romantic, are often marked by nodal ties between charts. So whether you are already in a relationship or thinking of embarking on one, look to see what the nodes are doing. Understanding these linkages will add another dimension to your insight into the relationship’s dynamics. Neeti Ray is an amateur astrologer with a deep love for all things astrological. You can read more of her work on her blog, Astrology Expressed. Thanks Neeti, that was a really interesting article! With two of my most significant men I have my Venus and my own South Node conjunct their South Nodes, so I guess I can see why we gravitated to each other so strongly. Would you mind adding something about oppositions? For example, my current interest’s moon is pretty tightly opposed to my North Node. Any insight? I would characterize this relationship as irresistible to both of us, but I have had to fight to get him to acknowledge the emotional connection that is obviously there. Does that sound about right? Hi Racheee, I’m glad you liked it. About his Moon opposition your North Node: it’s read and understood as his Moon conjunct your South Node. The tighter the orbs, the better. And, yes, this aspect would speak of a past life where he played a nuturing role where you were concerned. About your current synastry with him: one aspect does not really paint the whole picture so it’s important to compare both charts vis-a-vis other aspects. What would you say about the North Node of one partner conjunct the Ascendant of the other partner? Hi Lovely Libra, yeah, I love the nodes! See the glyph Jeff used on the home page? Look for that in the chart. That’s the north node. The south node is always 180 degrees from that (the chart won’t show the south node). So if NN is 10 Taurus, the SN is 10 Scorpio. I have an interesting thing I found. My current relationship has BOTH of our nodes opposite each other. His is MC-Aq/S-Leo and mine is MC-Leo/S-Aq… and both with Moons in Leo. Good match? A previous relation (one that I have never really gotten over)… he had the MC conjuncting my Asc (both with Neptune), and His Venus conjuncts my south node. Still trying to wrap my head around the meaning of this one. Any thoughts? Thanks for the reference, NR! Ahh, interesting. So if My True Node is Aquarius, that means my South Node is Leo? That also means that my South Node conjuncts my Sun by sign. The last man that I KNOW that I will be heartbroken for… was a Capricorn whose Moon-conjunct-Mars conjunct my Libra South Node. Did it feel intense! When I first saw him, I thought, “Hm.” 9 months later, found out he thought the same, too. Then it didn’t work out and now… wow. Good article – I don’t know much about the nodes and they don’t have any real mythology associated with them, which adds to my seemingly incomprehensible lack of grasp of the sibject. I had to bookmark the article, however; it seems that the Ocala, Florida public library wouldn’t allow a Internet connection to Sasstrology.com as it represents such a radical divergence from the sexual attitude they expect of library patrons … you know, like knowledge and open communication. Such things a library just cannot allow! Thanks, Art. The nodes are known as Rahu and Ketu in Indian mythology. thank you for this article i have been looking at the nodes lately and never really paid attentionto them before but i was plesantly surprised at the accuracy of some of the things written about the nodes in synastry i hav my NN trining his NN, moon trine NN as well as NN trining mars AND saturn i cant seem to find any info on pluto square though .anyone got info on pluto aspects? Though Pluto has to do with death and the underworld and all that, a much easier and understandable explanation was given me through a transit of Jupiter square Pluto I experienced once. Jupiter (gain, expansion, stuff!) was in square (imperfect emnity, an aspect I say is like two people arm-wrestling) with Pluto (getting rid of something = it’s death, you know). I had a lot of crap and I reached a critical juncture: I just had to throw some of it out or get a new place to live! Jupiter square Pluto, get it? So if Pluto is “getting rid of something,” you look at its sign and house placement to determine how it operates and in what area of life. What if her 29 Pisces Sun (3rd house) was conjunct my South node at 5 Aries and my Moon at 0 Aries (10th house)? South node is square Neptune and Jupiter – according to Solar fire. We have some very loose aspects, the only REAL aspects are mutual Jupiter/Dsc conjunctions, very tight, almost to the minute. Otherwise… My Saturn square her Mars (trine my Mars), Venus sextile Venus (conjunct with Chiron in my case and square my natal Mars), blabla, whatever. I just saw her a few minutes ago after months and months of keeping away, and well… I lost it. 🙁 The feeling was sooooo overwhelming it felt like the 6th grade all over again! Good thing she didn’t see me. 🙁 Her Saturn return is coming up and frankly, I fear for her. With Neptune so critical in Pisces (and her own in the 1st, along with her being a “heavy Piscean”), and her heavy (recreational) drinking along with her father’s suicide, Saturn’s return might be too much for her right now (passing over her Pluto and Moon, first). People think I am “in love.” I’m not. This is karma. A bad one, I guess, but nevertheless extremely powerful, one that cannot be ignored like “simple” love could (theoretically, I don’t believe a “sane” person could ignore real love, but let’s say someone would choose money over love, or something). The above birth information belongs to myself. Neeti please tell me anything that you can discern from the information provided above concerning this relationship. Wow, dude! My heart goes out to you! Nice to hear that guys can possess emotional intensity, although I’m sure you could do without yours the way I could do without mine. hugs! I love the nodes too NR. thanks for the article. Would you say a partner’s chiron conjuncting the other’s natal south node + venus conjunction is significant? thanks!